By Molly Wolf, M.D. and Joseph Makris, M.D. A previously healthy 27-month-old boy presented with a 3-day history of worsening right hip pain, fever of 103.1ºF, decreased oral intake, and irritability. The patient recently recovered from an upper respiratory tract infection, but otherwise had no significant past medical history. On physical exam, the patient was unable to bear weight on the right leg and had decreased range of motion due to pain. 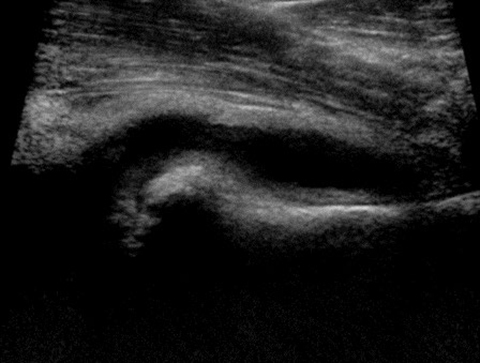 Ultrasound detected a right hip joint effusion (Fig. 1A). 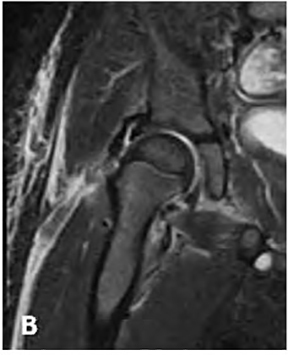 The patient subsequently underwent aspiration and drainage of the right hip joint. Synovial fluid had an elevated white blood cell (WBC) count of 176,500/ mm3. Further analysis of the patient’s blood revealed an elevated WBC count, C reactive protein (CRP), and erythrocyte sedimentation rate (ESR). Culture from the synovial fluid subsequently grew Streptococcus Pneumoniae. MRI performed after the joint aspiration was significant for a small amount of residual joint fluid and normal bone marrow signal (Fig. 1B). The child presented in this case had a 93 % likelihood of septic arthritis, meeting 3 of the 4 Kocher criteria, and underwent emergent incision and drainage and subsequent intravenous antibiotic therapy. While strictly defined as inflammation of the bone, osteomyelitis is most always the result of bacterial infection.6 In children, the bacteria, most commonly Staphylococcus aureus, spread hematogenously and deposit in the bony metaphysis.7 Clinical presentation is often non-specific with mild symptoms, consisting of malaise and low grade fever during the bacteremic phase; subsequently, there is redness, warmth, pain, and decreased range of motion when bacteria seed the bone.7 Symptoms present for more than 10 days may correlate with bony destruction.7 Laboratory testing is characteristic with elevated ESR, CRP, and WBC; however, the diagnosis is greatly aided by imaging. Presentation of a limping child due to hip pain is a common complaint in primary care. Although the causes can be quite varied, a complete history, physical exam, and strategic imaging are important to localize the process to a specific anatomic area and appropriately narrow the differential diagnosis. When pain is localized to a joint, imaging is critical to identify the presence of joint fluid and any secondary complications. In this child with a hip joint effusion, inability to bear weight, fever, and elevated ESR, the probability of septic arthritis was very high and emergent aspiration was indicated. Kocher MS, Zurakowski D, Kasser JR. Differentiating between septic arthritis and transient synovitis of the hip in children: an evidence-based clinical prediction algorithm. J Bone Joint Surg Am 1999; 81(12): 1662-70. Pääkkönen M, Peltola H Management of a child with suspected acute septic arthritis. Arch Dis Child 2012; 97(3): 287-292. Garcia-Arias M, Balsa A, Mola EM. Septic Arthritis. Best Pract Res Clin Rheumatol 2011; 25(3): 407-21. Harik NS, Smeltzer MS. Management of acute hematogenous osteomyelitis in children. Expert Rev Anti Infect Ther 2010; 8(2): 175-81. Steer AC, Carapetis JR. Acute hematogenous osteomyelitis in children: recognition and management. Paediatr Drugs 2004; 6(6): 333-46. Do TT. Transient Synovitis as a cause of painful limps in children. Curr Opin Pediatr 2000; 12(1): 48-51. Zawin JK,Hoffer FA, Rand FF, et al. Joint effusion in children with an irritable hip: US diagnosis and aspiration. Radiology 1993; 187(2): 459-463. presentation of intracranial disease associated with Langerhans histiocytosis. Am J Neuroradiol 2004;25: 880-91. Wolf M, Makris J. Limping Child. J Am Osteopath Coll Radiol. 2013;2(4):26-28. Molly Wolf, M.D. and Joseph Makris, M.D. Dr. Wolf is with the University of Massachusetts Medical School, Worcester, MA and Dr. Makris is with the Department of Radiology, UMass Memorial Children’s Medical Center, Worcester, MA.